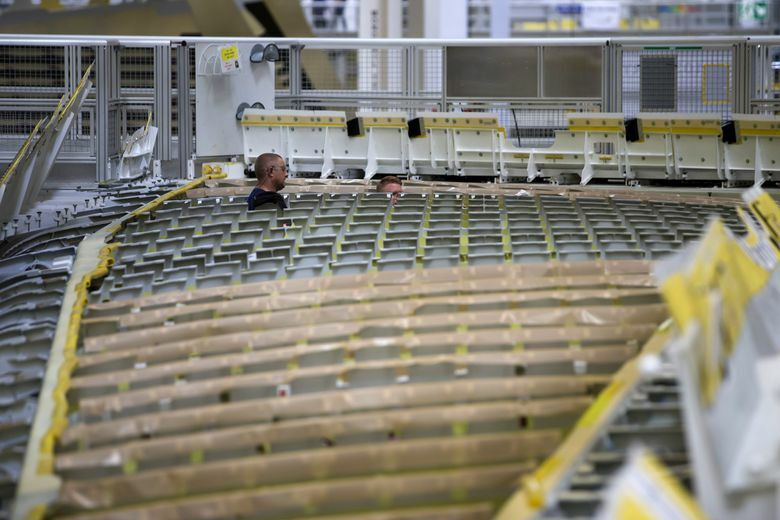 Inside a huge north Wales facility specifically designed for automation, Airbus assembles the wings of the A350, currently the largest composite wings in commercial aviation. In Everett, Boeing will have to match this technology to build the giant wings of its forthcoming 777X. BROUGHTON, Wales — Like a cartoon space alien with a dome-like skull, an Airbus Beluga transport plane arriving from Madrid drops from the sky above this village 200 miles northwest of London and taxis to a stop with its front end tucked inside a large building off the runway. Its bulbous forehead pops open to disgorge massive wing panels — 98 feet long and 20 feet wide — that will soon be assembled by sophisticated robots and about 800 humans into the largest carbon-fiber composite wings now built for commercial aviation. Ninety minutes later, it’s ready to take off for Bremen, Germany, with a new load so large it must be tilted at a 45-degree angle to fit inside: an almost complete A350 wing. • About 6,000 people work at the 700-acre Broughton site, building Airbus wings. • The carbon-fiber wings of the new large twinjet A350 are built in the north factory, opened in 2011. • Wings for the A320 and A330 jets are built in the east factory that dates back to World War II. • The wings of the A380 superjumbo jet are built in the west factory, opened in 2003. This model of technological prowess, combined with geographical inefficiency, is what Boeing is contending against as it gears up to make its own, even larger composite wings for the 777X in Everett. On a recent tour of the half-million-square-foot main building, partially assembled wings glided in and out of fixed stations, drilled and fastened mostly by robotic machines. The key pieces were designed and built by Mukilteo engineering firm Electroimpact, a prime supplier to this wing facility that opened five years ago. Like Boeing’s 787 Dreamliner, the A350 has wings, tail and fuselage made from carbon-fiber composites. The initial A350-900 model, which entered service last year and carries 325 passengers, competes with the 787 Dreamliner. The larger A350-1000, carrying 366 passengers, is to begin flight tests this fall and will compete against Boeing’s 777. It will also go up against the 777X, which will feature new composite wings attached to the traditional metal 777 fuselage. To build such large composite wings is a major technological undertaking. The parts must first be fabricated from carbon-fiber tape infused with epoxy resin that is baked to hardness in massive high-pressure ovens called autoclaves. Airbus’ composite parts are fabricated at facilities scattered widely around Europe, in England, Scotland, Germany and Spain. 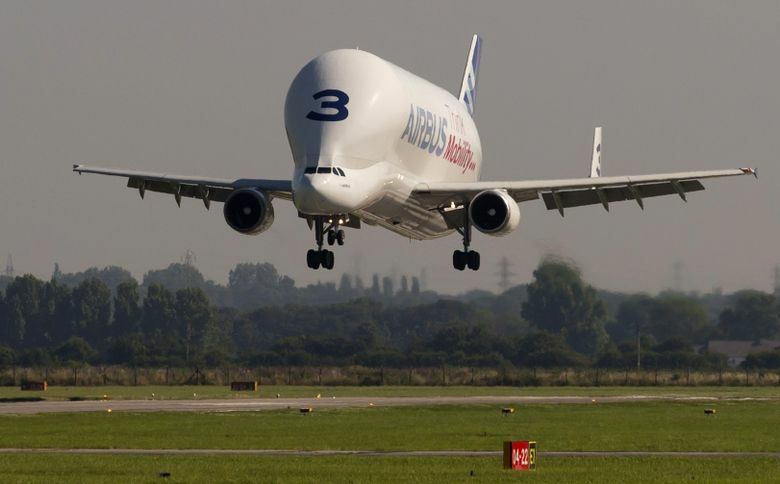 The one-piece wing skins are so large they must be flown to Broughton in the ungainly, custom-built Beluga. The assembly process begins with mechanics stacking the aluminum ribs and composite spars that form the wing’s ladderlike internal skeleton onto a movable cart that holds the unfastened pieces in position. In the first station, this loose assembly is laid horizontally on top of the lower wing skin and the upper wing skin is dropped into place on top. Movable arms aligned with lasers push and hold the structure into its precise alignment, which includes a twist to the outer end of the wing for better aerodynamics, as the automated machine tacks the structure together with temporary fasteners. The wing is then moved to the next station, where a big Electroimpact machine drills and fills new holes to permanently fasten the wing skins. As the machine stitches the wing together, two operators sit underneath it, monitoring the fastening process and controlling it where necessary with handheld triggers. Creation of the basic wing structure is the most automated piece of the process. After that, it takes a lot of manual work to complete the wing: Altogether, about 800 mechanics and engineers work directly on the A350 wing at Broughton. When the wing is backed out of the Electroimpact fastening machine and movedalong to the next station, a metal platform closes around it. Mechanics walk around the wing on this platform, kneeling on pads along the edges to install the final fasteners by hand. In the last station, mechanics install brackets on the wings’ trailing edges. Each has a kit ready to hand with slots holding every bracket and bolt needed for the job, as well as a drawing showing where each piece goes in the assembly. The wing then leaves the main building, delivered by transporter to the wing equipping facility next door, for the installation of the leading edge panels, the fuel system and the remaining brackets for wire harnesses. Before it exits, the wing gets a coat of beige protective paint and the fuel system is tested for leaks. Yet even now, ready to leave Broughton, it’s still not a full wing. 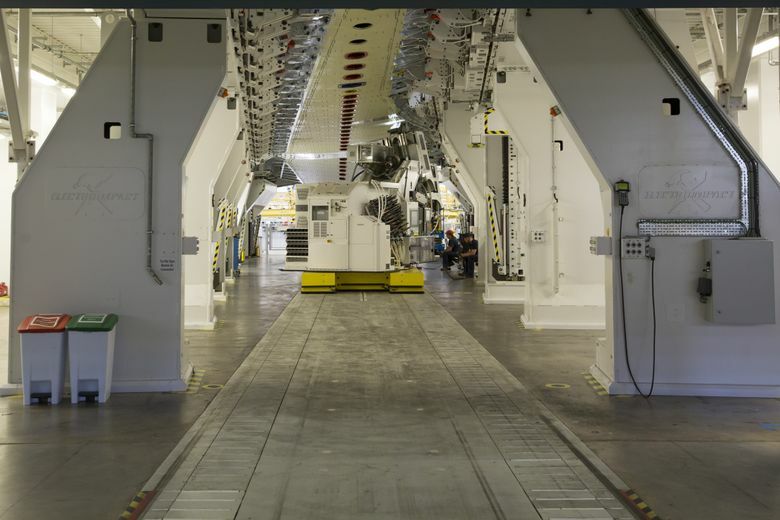 The wing is transferred via Beluga to Bremen, where the big trailing-edge flap is attached and the final hydraulic, pneumatic and electrical systems are installed. Broughton has done most of the work, Bremen has finished it. Only then is the complete wing flown one more time in the Beluga to Toulouse, France, for A350 final assembly. 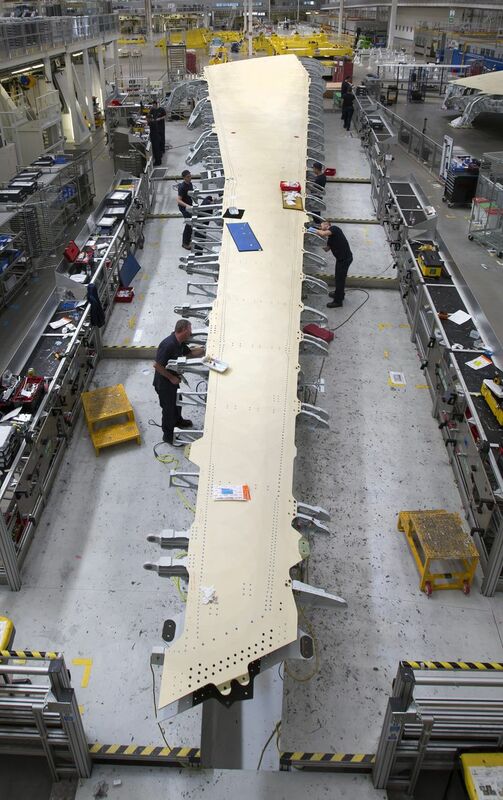 This year, shortages of interior components have delayed A350 final assembly. Airbus has delivered just 21 of the jets through the end of August, with many more sitting on the flight line awaiting seats or lavatories. Yet Broughton continues to churn out eight sets of A350 wings per month, with a plan to go to 10 sets per month, then 13 sets per month by the end of 2018. Boeing’s 777X composite wing, including a 12-foot-long folding wingtip extension, is 10 feet longer than that of the A350. With the large wing parts being fabricated on site in a new, highly automated $1 billion building, there’ll be no need for anything like Airbus’ expensive parts-delivery operation. While Airbus has to truck wing spars from England and Scotland, and fly in the wing skins from Spain and Germany, Boeing will simply deliver the big 777X wing parts next door, into the main Everett plant, said Jason Clark, Boeing vice president of 777X operations. “The entire wing from spar and stringer fabrication all the way through final assembly is going to happen right here on this site,” said Clark, in an interview at Boeing Everett. Yet in trying to emulate the automated efficiency of Broughton, Boeing also has a disadvantage. Rather than working within a clean-sheet, purpose-built facility like the Airbus A350 wing factory, Boeing must clear space to assemble the 777X wing inside that widebody jet-assembly building in Everett, originally constructed in the late 1960s and expanded in the 1990s. Although it’s the largest building by volume in the world, right now it’s filled with equipment for building not only the 777 but also the 747, 767, and 787 jets. There’s room to shift lots of the tooling around, but it won’t be as easy as moving into a brand-new space. Clark said Boeing will reveal details of its plan for 777X wing assembly soon, but for now indicated only a broad outline. He said Boeing has learned both from Mitsubishi’s experience building the 787 wings in Japan and from its own highly efficient operation in Renton for building the 737 wings. Citing the horizontal-build format in Renton, Clark implied that the 777X wings will be assembled flat to allow both mechanics and robots easy access. Among the major suppliers of integrated automation equipment involved, Clark mentioned Electroimpact and MTorres. As noted, Electroimpact supplies key drilling and fastening equipment on the A350 wing assembly. And it supplies to Boeing the carbon-fiber lamination technology that will be used to fabricate the 777X wing skins and spars. MTorres is a Spanish company that supplies all the carbon-fiber lamination equipment used to fabricate the wing parts of the A350 in Britain, Germany and Spain. It has established an engineering team in Everett and supplies Boeing with integrated manufacturing cells that bond the stringers to the 777X wing skins. With this degree of cross-pollination, it’s not surprising that the Boeing plan — horizontal build, highly automated, common equipment suppliers — sounds like it could be similar to what Airbus is doing in Broughton. The automation that will do the drilling and fastening likely won’t look like the automotive-style robots that Boeing is now introducing, with considerable difficulty, to build the 777 fuselages. Instead, as in Airbus Broughton, the business end of the robotics will almost certainly travel along the wing on an overhead gantry.